We’ve been doing it right for over 20 years – place an order for take-out or delivery today! 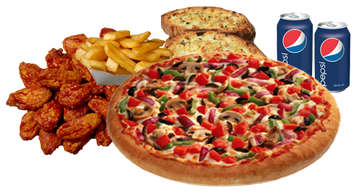 At Jumbo 3 for 1 Pizza & Wings, we use fresh ingredients and toppings to bring you the best pizza in town. A lot has changed since we started 20 years ago, but one thing remains the same – we still make our pizza dough fresh every day, along with your favourite toppings and our secret recipe pizza sauce. With our home-style pizza, we bring Italy right to your doorstep! Whether you’re craving pizza, wings or cheesy garlic bread, we guarantee we have the right fit for you. 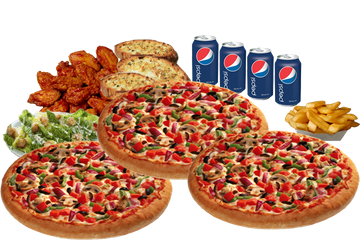 For mouth-watering pizza combos in Guelph, give us a call today! Our entire menu is available for take-out and delivery. Whether you are cramming for an exam, hosting a party or getting take-out for one, we have several amazing pizza and wing deals to choose from! Browse through our menus below and then give us a call to place your order for take-out or delivery. You’d be pleased to know that debit-at-your-door service is now available for deliveries. If you are having a big party or gathering, call us in advance to place your large order. We’ll give you the best deals with surprising discounts. 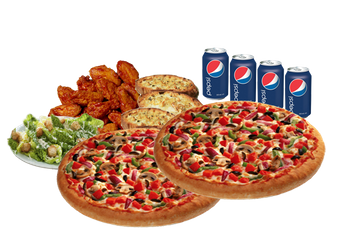 With Jumbo 3 for 1 Pizza & Wings, you can always trust that your order will arrive at your door, hot and fresh. 3 topping triple pizza combos – available in small, medium and large. No picky eaters here – double pizza combos with three toppings each. 3 topping pizza with wings, garlic cheese bread or potato wedges, and pop.